bigmunkeyman | Live life,love music,love life,live love ! Live life,love music,love life,live love ! 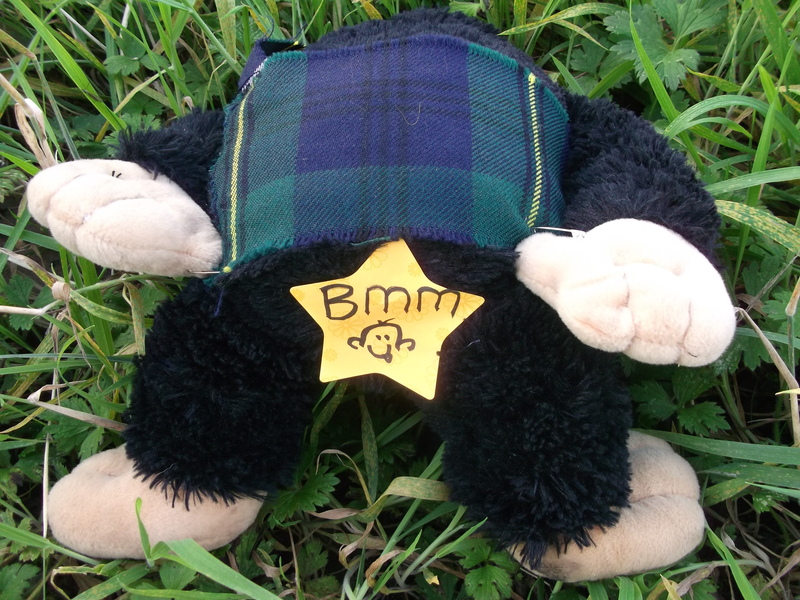 The recent rumours on the internet that bigmunkeyman has passed are just not true, well, as far as he knows! If anyone has any further information regarding the fact as to whether he is in fact dead or not, could they please let him know, as he owes money and his wives would like to know one way or the other! BIGMUNKEYMAN’S BIG MONSTER MOVIE MASH-UP. Hey hey there fellow jammers. Oh yes, it’s that time of year again … the Halloween PAAAARTEEEE ! This years theme was about some of my favourite horror films and of course everyone made the effort to dress up in the spirit of things…… well, almost everyone !! 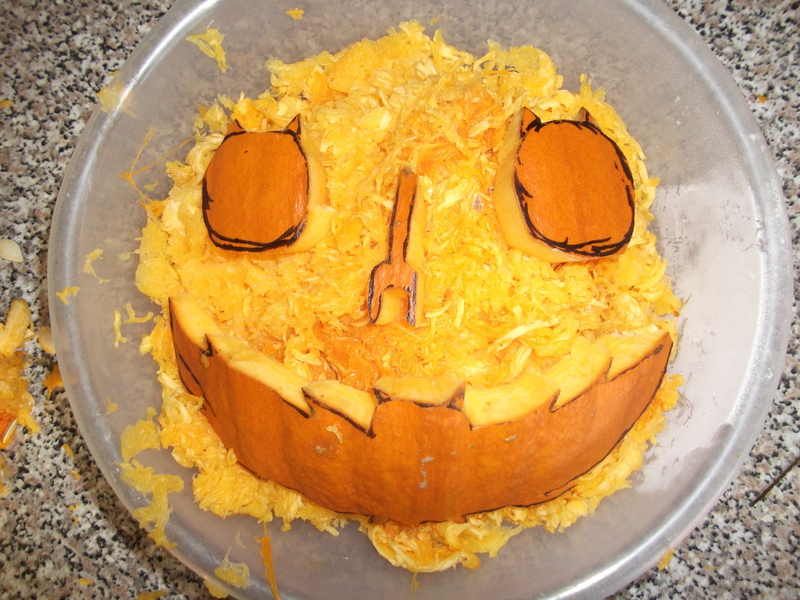 I don’t know who carved the pumpkin but we have no idea where to put the candles !?! First to arrive was me old mate Tui, who decided to keep things low key with just a mask. 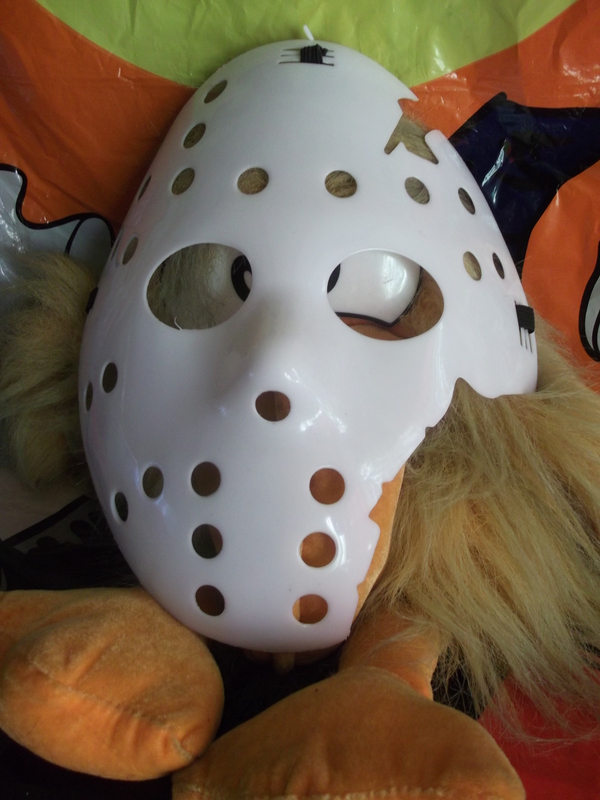 Obviously he came as ‘Jason’ from ‘Friday The 13th’. Well I’ve no idea how the hell he managed to kill all of those college kids with eyes that crossed !!! Friday the 13th is an American slasher movie from 1980. It was directed by Sean Cunningham and it was prompted by the success of John Carpenter’s ‘Halloween’, another good old slasher movie ! Des came as ‘Jack’ from ‘The Shining’. Now this was one hell of an effort, considerin’ as I now have no front door!! HERE’S DESSIE ! !’The Shining’ was filmed in 1980 by one of my favourite directors, Stanley Kubrick and was one of many Stephen King books brought to the big screen. A pretty creepy film and book. 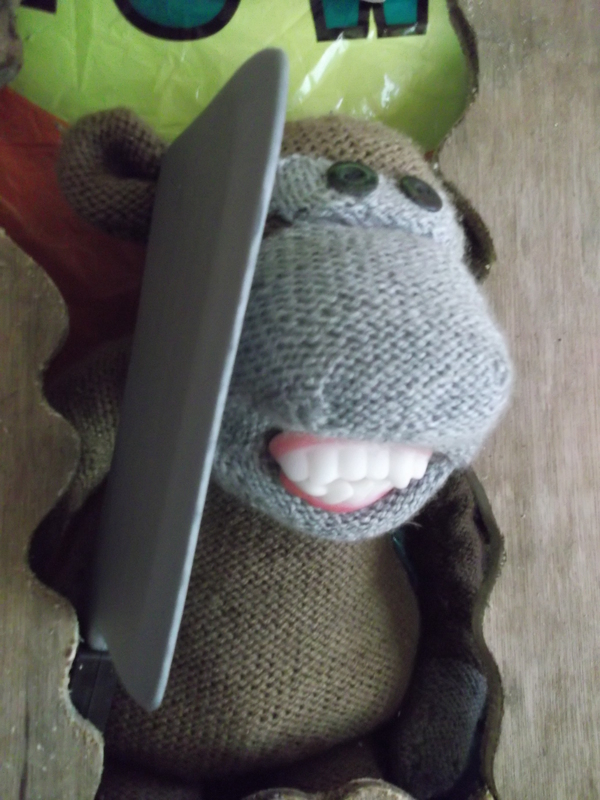 I came as one of the characters from a self financed, directed, produced and distributed bigmunkeyman martial arts movie I starred in some time ago. 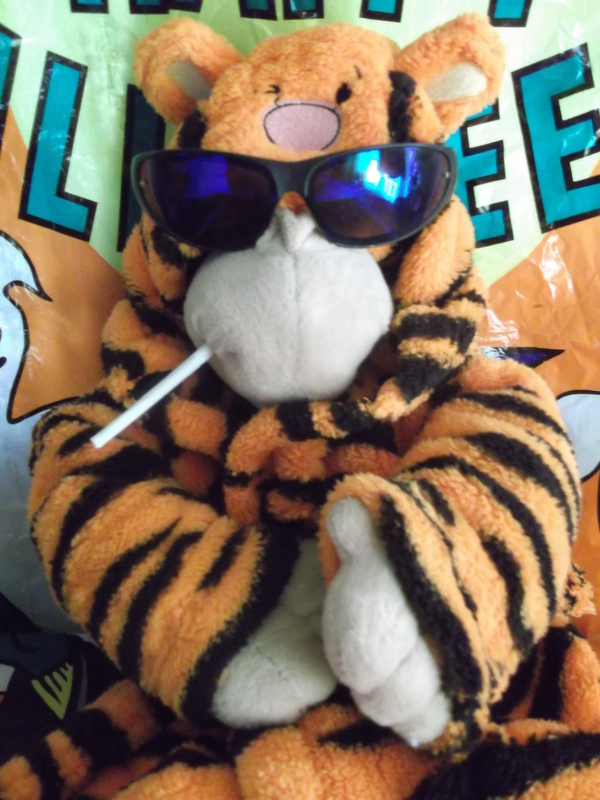 This film was called “SMOKING TIGER, HIDDEN MUNKEY” Some people said that the true horror of this film was my acting…. 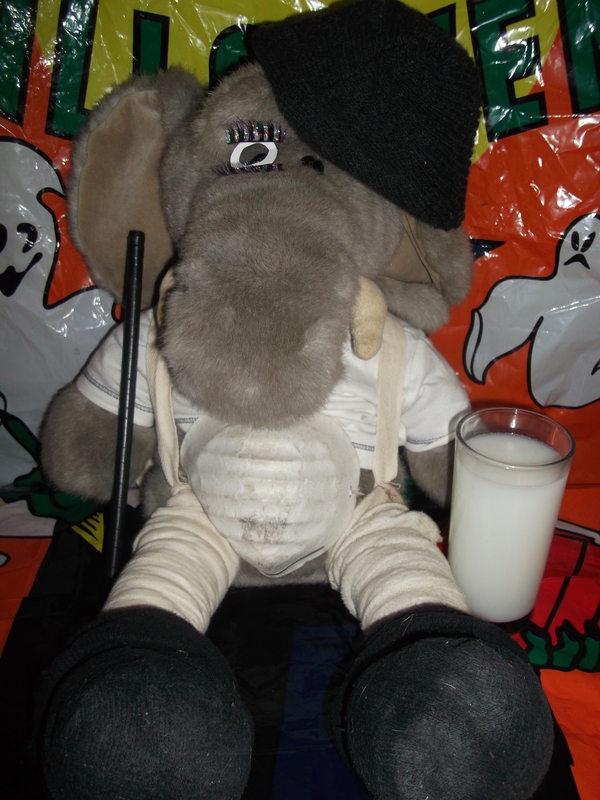 directing… producing…..
We all thought that the best character went to Engel who came as ‘Alex’ from ‘ CLOCKWORK ORANGE’. This has to be one of the most iconic films of all time. It was filmed in 1971 by yet again Stanley Kubrick and was actually withdrawn from public viewing for 27 years !! Only after Kubricks death did it reappear in cinemas. Catch yer later droogs ! 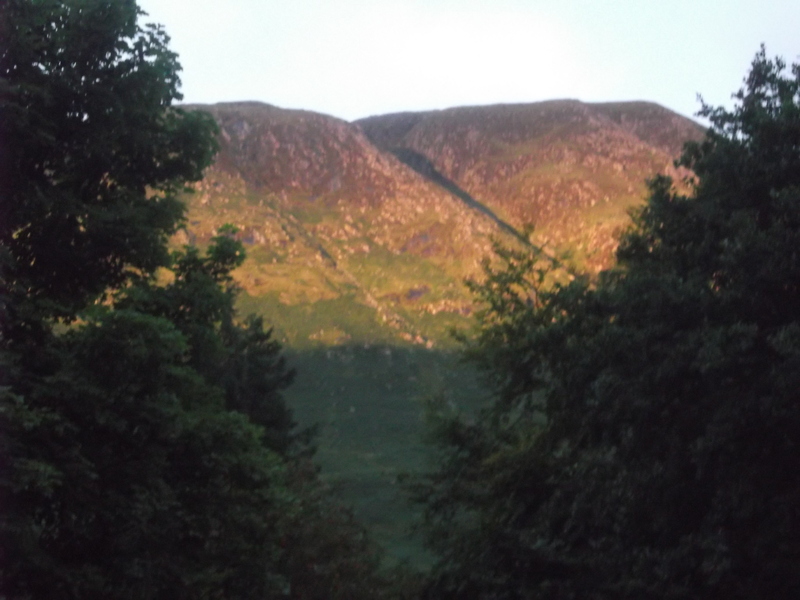 WILL THE REAL BEN NEVIS PLEASE STAND UP ? 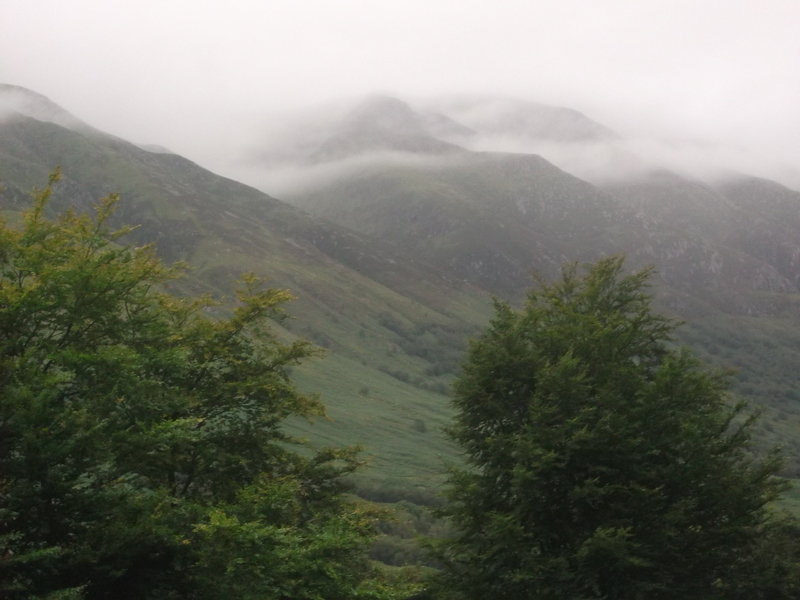 Hey jammers, so after the water came the mountains….. or one in particular….. Ben Nevis. I actually thought we were meetin’ up with me old jammin’ mate Ben Nevis, who used to play bass when we were in ‘The Miskaberts’ !! But no, we were here to witness the highest mountain in Britain standin’ 1,344 metres above sea level and I, yes I was supposed to be climbin’ it tomorrow ! Have you seen the size of that bloody thing ?!? Gypsy Toots McMaytal said ” Wow, look at the misty top !” Now I’m sure Misty Top was the drummer in one of the bands I giigged with ? Ben Nevis ( the mountain not me mate) is close to Fort William and it’s part of the 3 peaks challenge where mad buggers climb Ben Nevis, Scafell Pike (England) and Snowden (Wales) in 24 hours !! It may take me a bit longer than that to attempt just the one mountain! 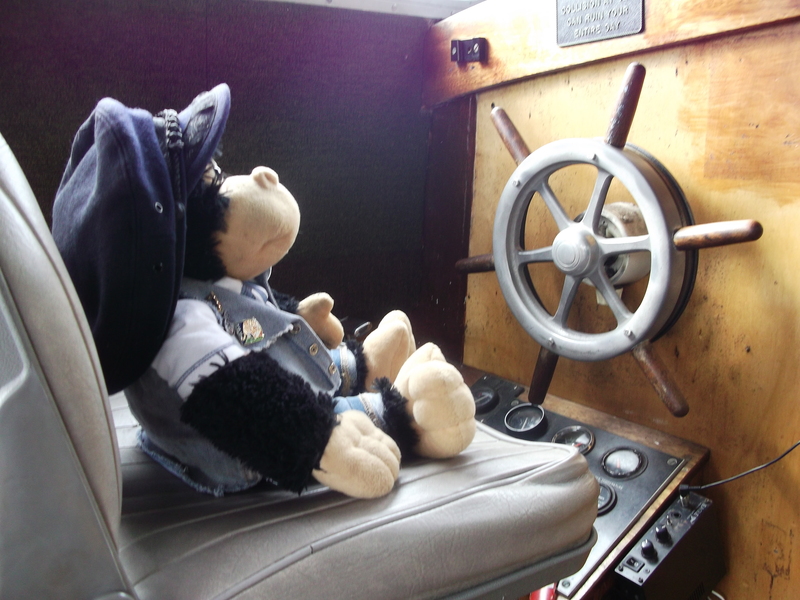 So, I can’t put it off any longer I’d better get me little monkey legs goin’! Crikey, is that a road down there ? I’ve not been this high since Woodstock !! 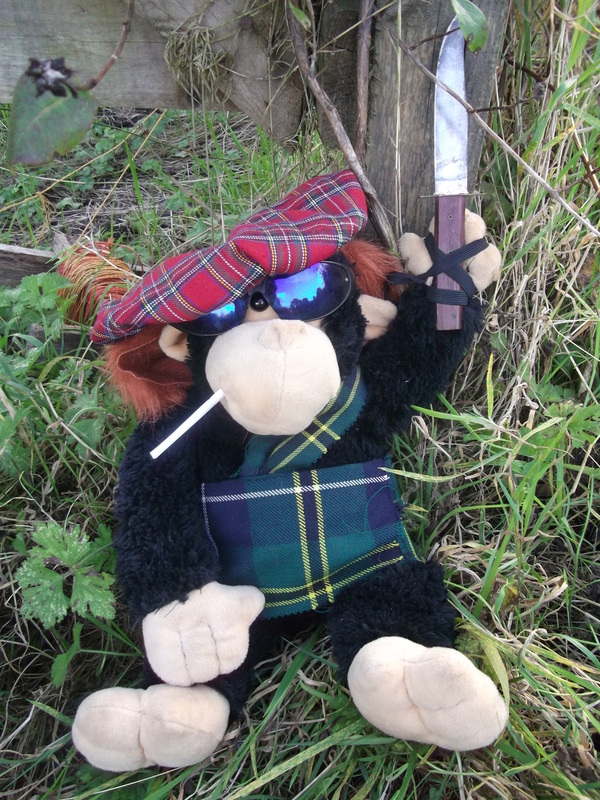 Had to have a little rest, too many fags ( err, cigarettes to my American comrades !) People kept comin’ past all done up in moutaineerin’ gear, boots, raincoats, backpacks…….. me……. barefoot, kilt an’ no knickers !! 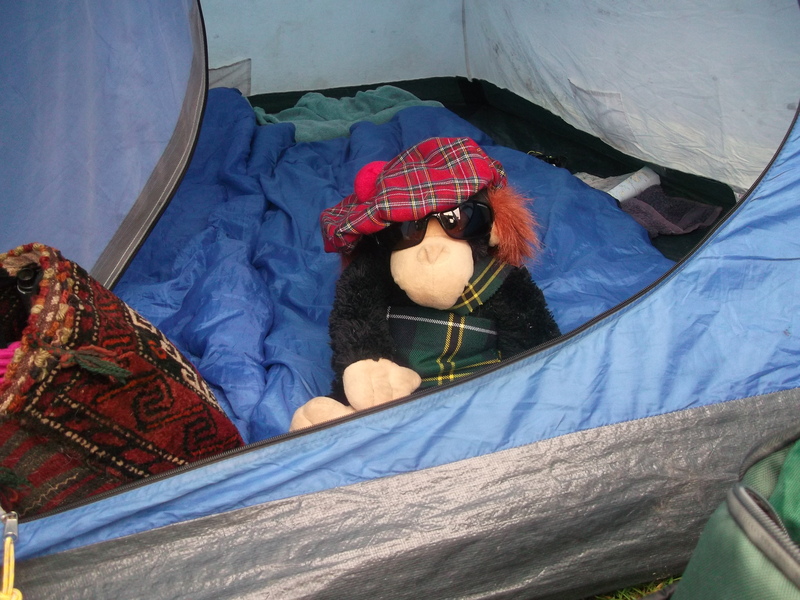 Back safe at camp, havin’ a few well earned beers with a couple of mad Glaswegians an’ we hear the sound of bells, whistles, klaxons and helicopters as it gets dark. Think someone is in trouble up the mountain an’ for once it’s not ME ! Jokin’ apart it takes at least 8 hours to complete the Ben Nevis hike an’ a lot of people leave it too late in the day to set off an’ get back before dark. Personally I wanted to be back before the pub opened….. I have to say that all of the people that I’ve met along this journey have made it something special, from Edinburgh ‘Sons of Scotland’ (Ottawa) to Dundee lady ( Innit?) , through to Scottish pipers, haggis, and loads of drivin,’ endin’ with my last night on the beer with a couple of mad Glaswegians, you know who you are, but it was all worth it. You can take our underpants but you’ll never take our FRRREEEEDOM!!! William Wallace eat yer heart out. 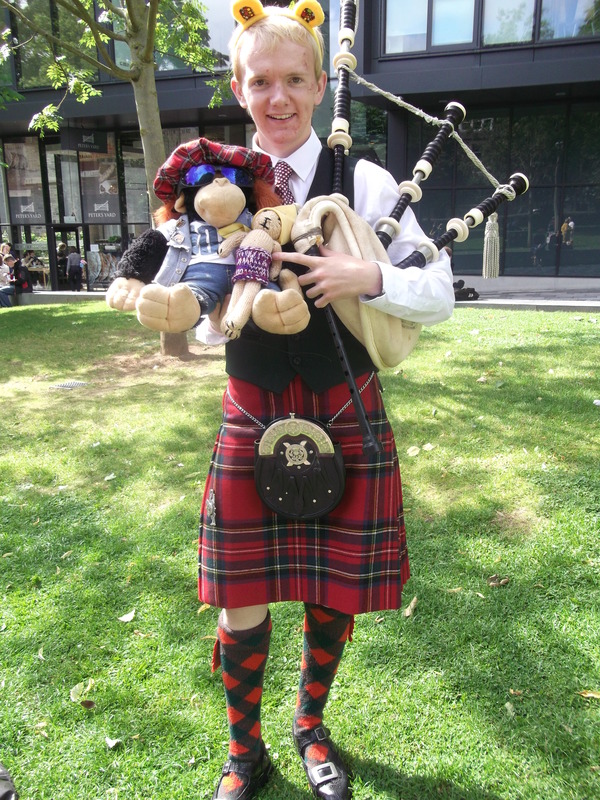 As people always ask ” Do you wear anythin’ under yer kilt?” What do you think !!! I’m bigmunkeyman ! Hey jammers, how’s yer jammin’? 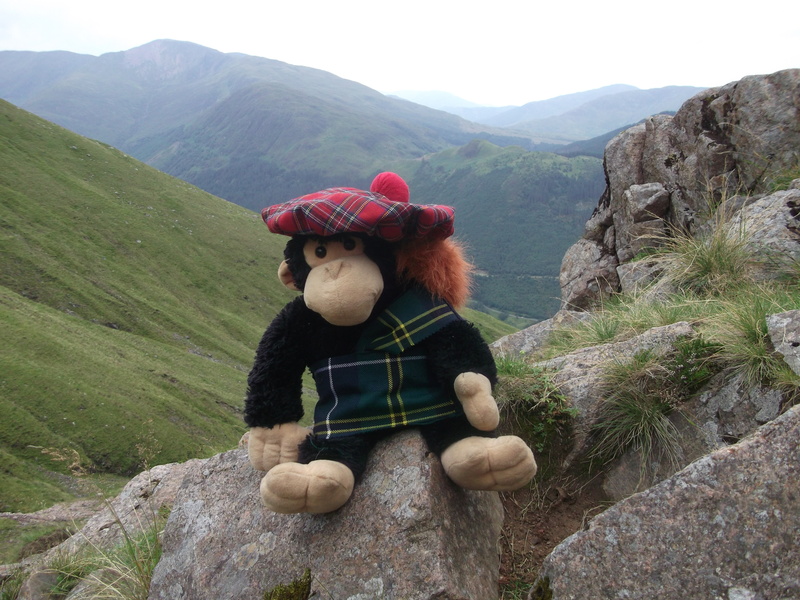 And so we are now on the penultimate leg of the bigmunkeyman’s big tour of Scotland. 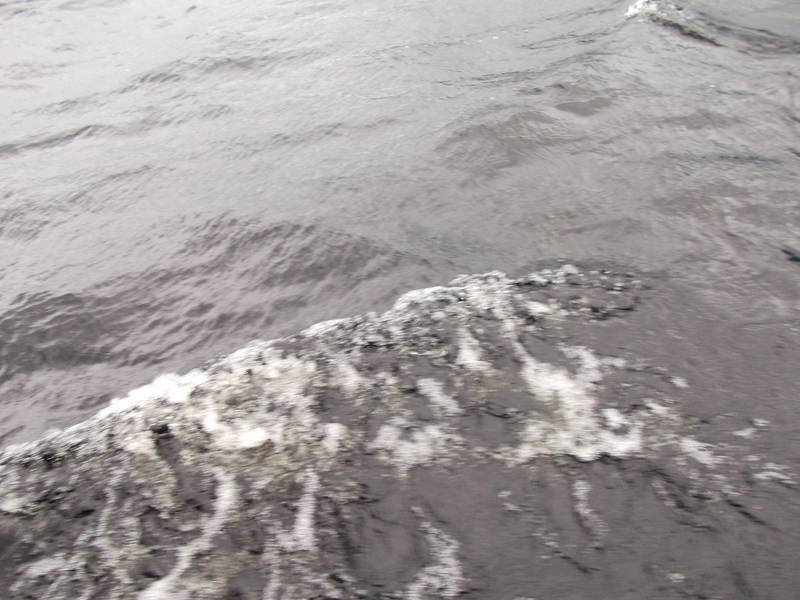 And yes, I ‘m still lookin’ for the elusive Nessie! 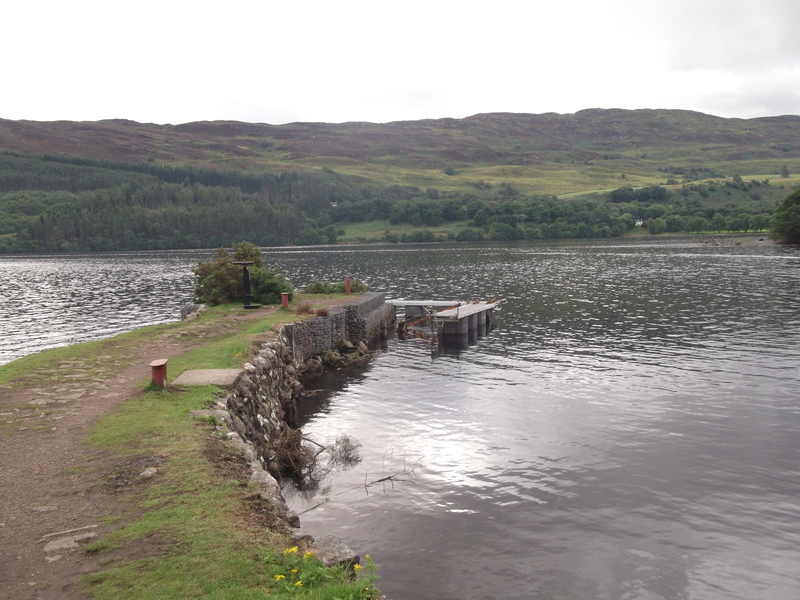 We now find ourselves after a short journey along the side of Loch Ness, at Fort Augustus, a very scenic little village situated at the bottom part of Loch Ness. 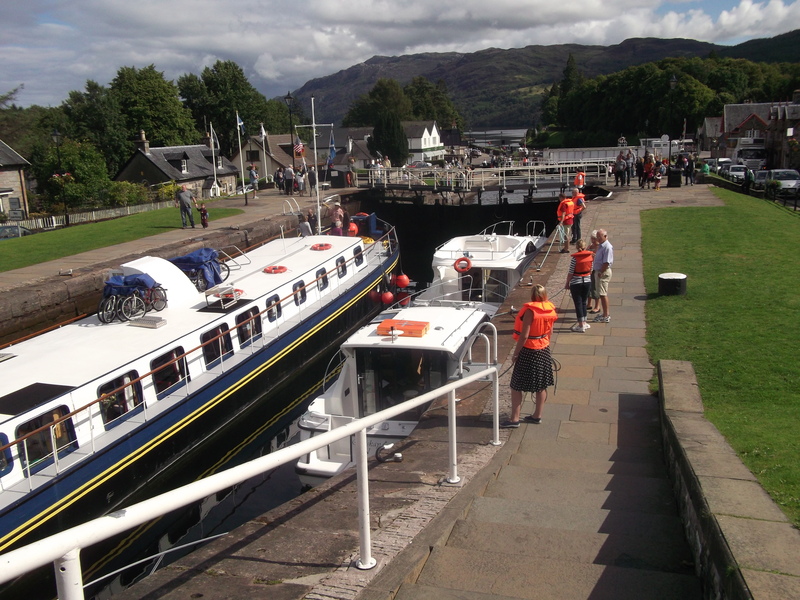 This is where the Caledonian Canal connects Fort William to Inverness passin’ through Fort Augustus, in a series of locks. The canal is 60 miles long, has 29 locks, 4 aquaducts and 10 bridges ! Whew, bet that takes all day to get through !! Glad I wasn’t pilotin’ any of those boats ! 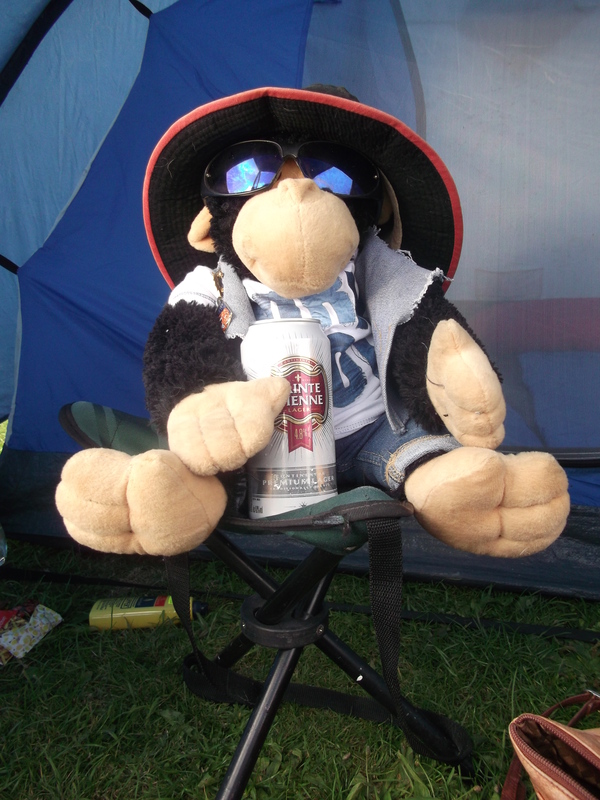 Anyway, after all this excitement it was time to cool down with a chilled beer or two whilst contemplatin’ the stunnin’ views. 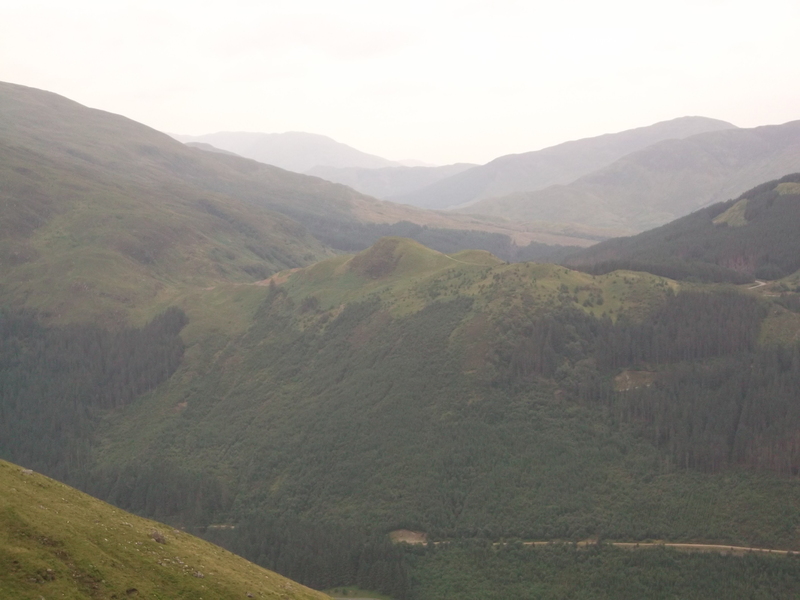 23 miles in that direction is Inverness. Where the hell is Nessie ?? It was so magical and peaceful that I could’ve sat here all day….. in fact I did….. hic !?! No, I said I was lookin’ for ‘Nessie’ not ‘Wizzy’ !! Bloody predictive text ! Can’t believe that dog turned up in the same hat as mine ! Obviously Nessie is bein’ her elusive self and isn’t gonna show up, but she’s the one who’s gonna miss out seein’ me in all my regalia, William Wallace eat yer heart out ! Now, I’m off to find out what everyone is pointin’ at behind me. Next stop is to find out what all the excitement is about this ‘Ben Nevis’ person ! 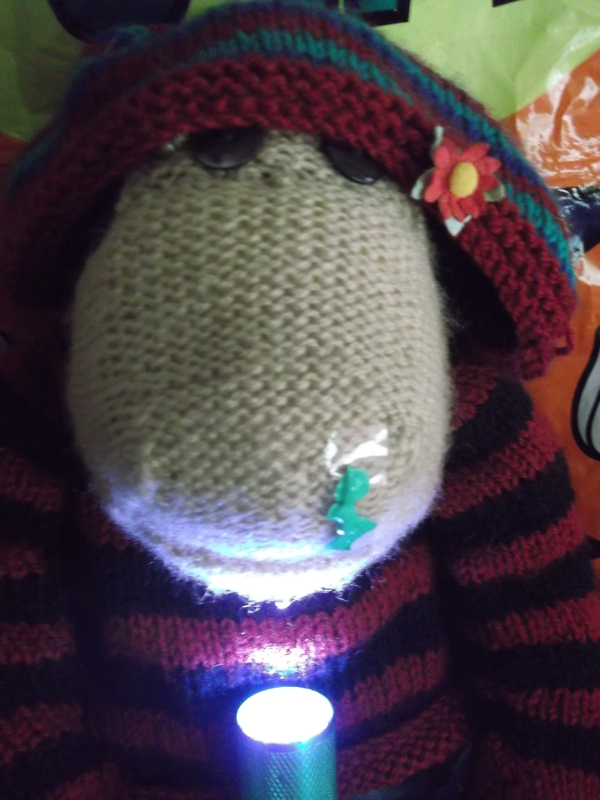 Hey there fellow jammers an’ Nessie hunters, let’s go look for Nessie. So, after gettin’ a jump start from a local’s pick up truck ( my fault the battery was flat, I’d left the radio on !! 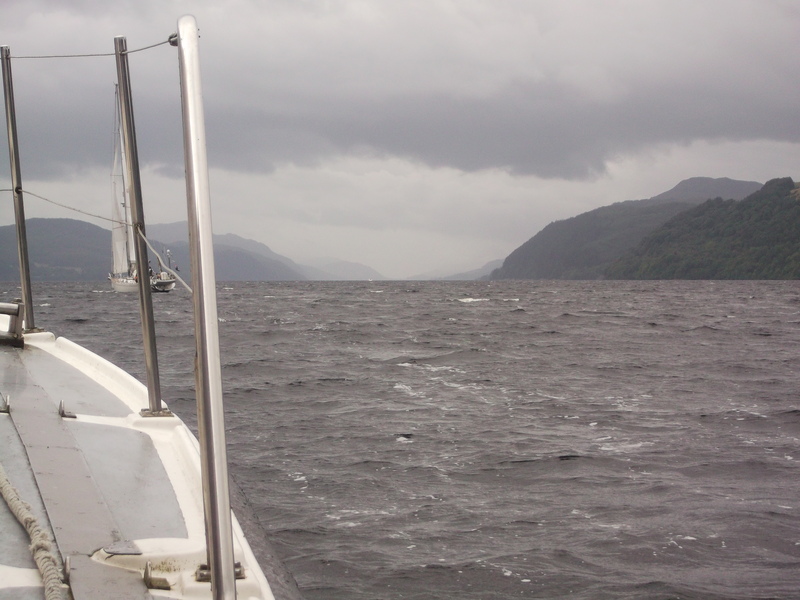 ), we headed out onto Loch Ness, an’ just cruised for a while. 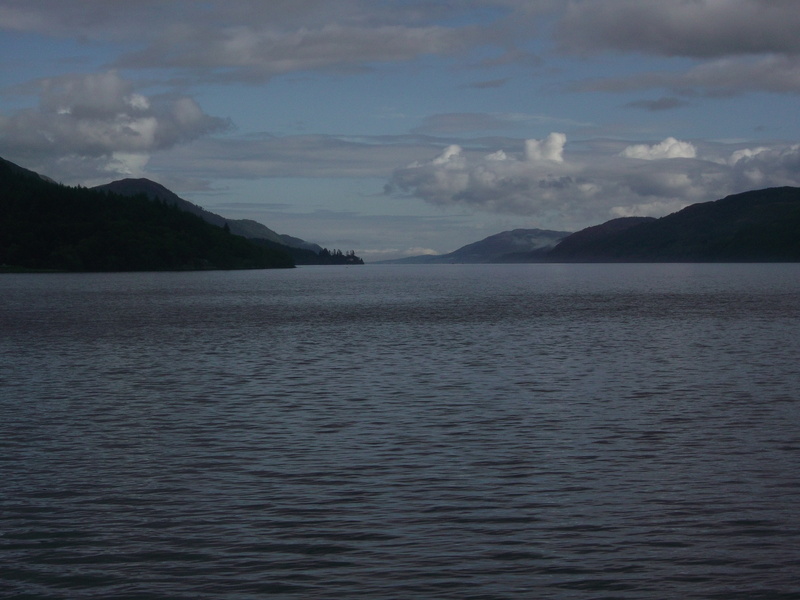 Now, this loch is over 23 miles long and 750 feet deep ! This may take some time! I don’t know about a bigger boat, this may need a bigger diesel tank ! But hey, Nessie is worth it ! Don’t know who was drivin’ at this point, I’d had a few Glenmorangies . I do remember feelin’ a bit of a bump at one stage, hope it wasn’t me mate Nessie!! There have many been sightings of a ‘water beast’ on the loch as far back as the 6th century ( even before I was born! 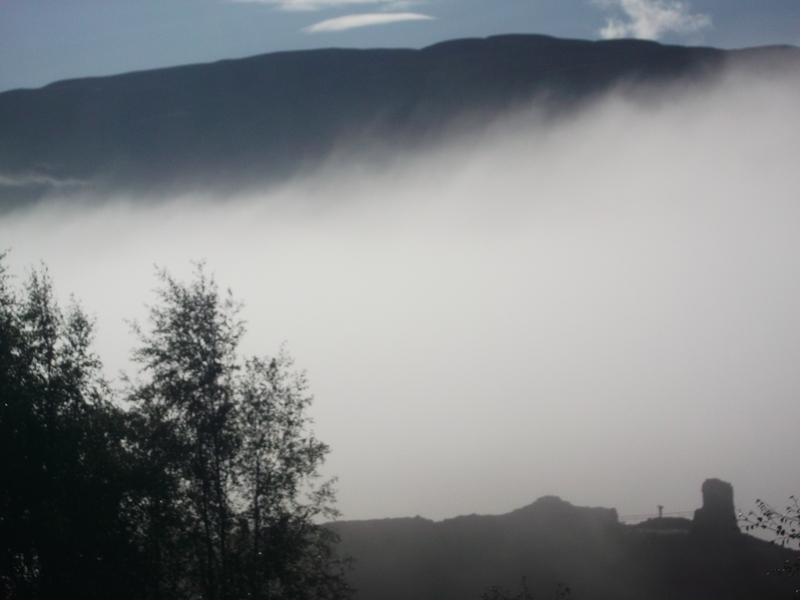 ), but it was in the ’30’s that many sightings bought the attention of Nessie to the world. There have been over a thousand catalogued sightings! Many people try to disprove these sightings but how do we know? There’s a hell of a lot more to this earth than us earthlings could ever comprehend…… and I used to go drinkin’ with Nessie, so there! 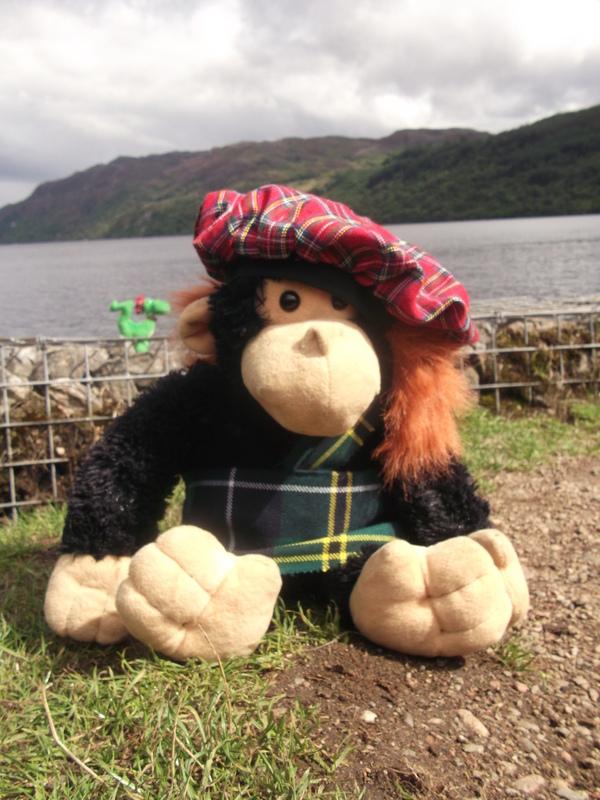 Does Nessie exist…… is there a Loch Ness monster…… of course there is. 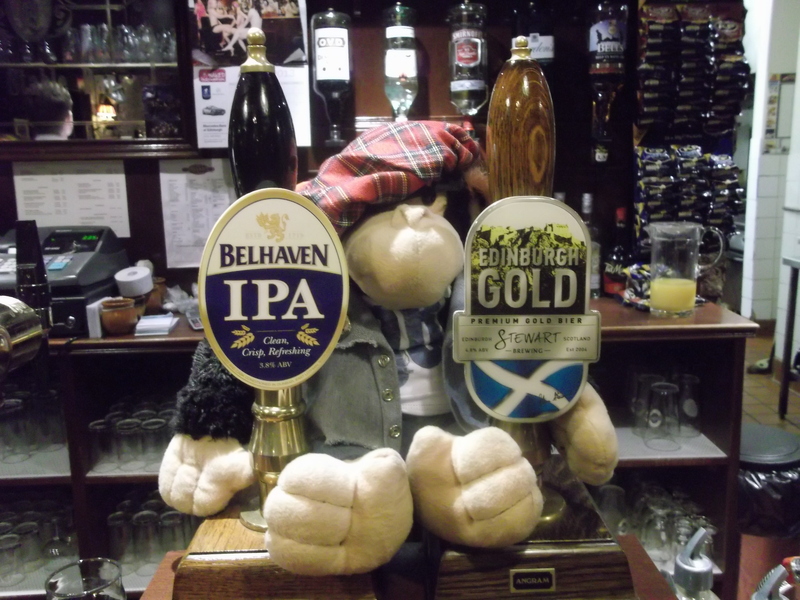 Ah Nessie, come on, show yerself, you know it’s your round ! After a great day of tourin’ round ( and we’d drunk the boat dry! ), it was time to get our land legs back. Arrivin’ back at the campsite who should we bump into but Toots. ” Where the hell have you been ?” I asked in surprise. ” I had an experience in Edinburgh and hitched a ride here on a rather large green prehistoric plesiosaur” she replied. Toots was dressed in a rather obscure way and told me that she now read coffee cups. ” Don’t you mean tea leaves?” I asked. 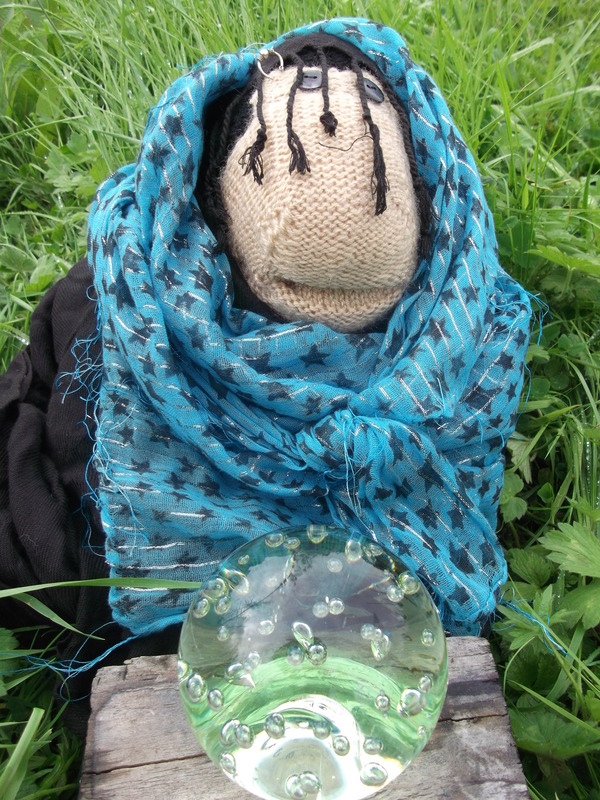 She is now goin’ by the name of Gypsy Toots McMaytal. 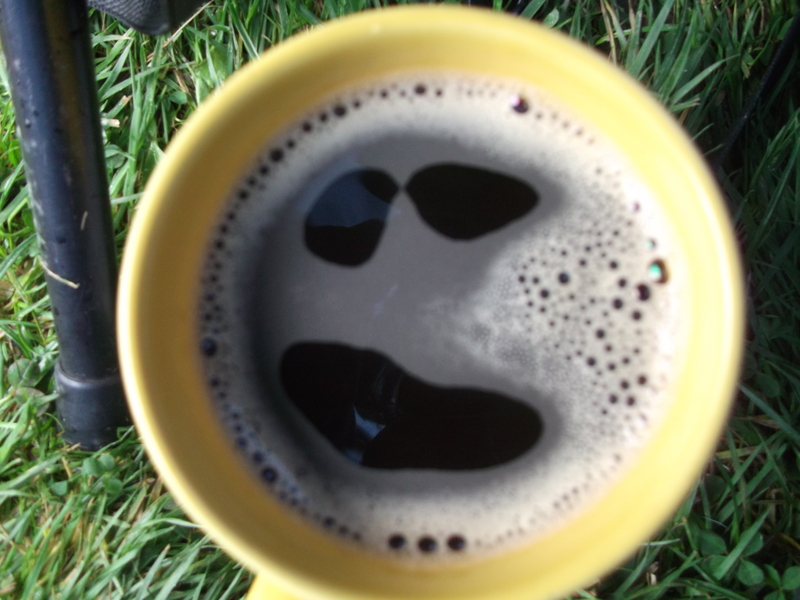 Well, we may not have found Nessie today but as Gypsy Toots ‘ coffee reading say’s……. Tomorrow’s gonna be a good day ! Ok then, next stop Fort Augustus. Catch yer later fellow jammers and Nessie hunters. After me last night in Edinburgh, where I’d paid me way by workin’ a few shifts behind the bar ( I actually drank more than I earned! 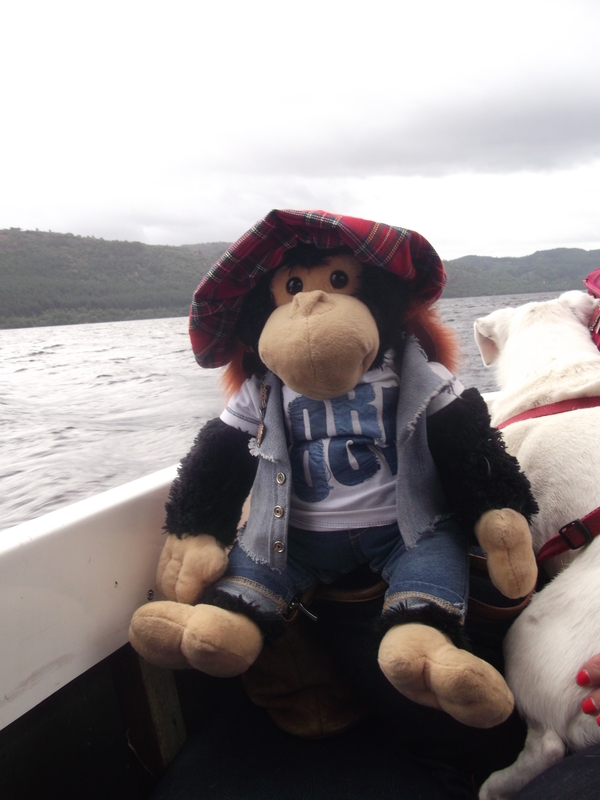 ), it was off to Loch Ness to look for me old mate Nessie. 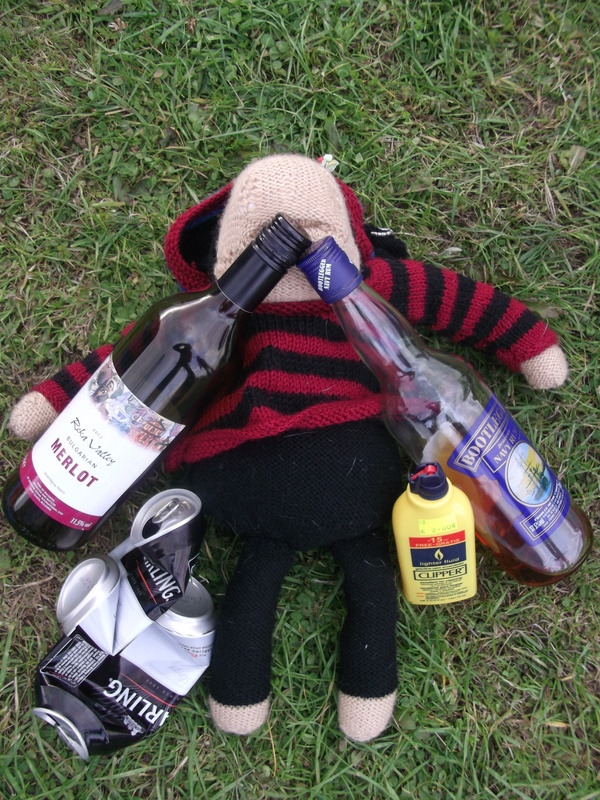 Got back to the tent to find Toots had had more than a good time at the festival !! So, with me drivin’ an’ McArthur navigatin’ ( with his door firmly locked! ), we set off from Edinburgh to Inverness. 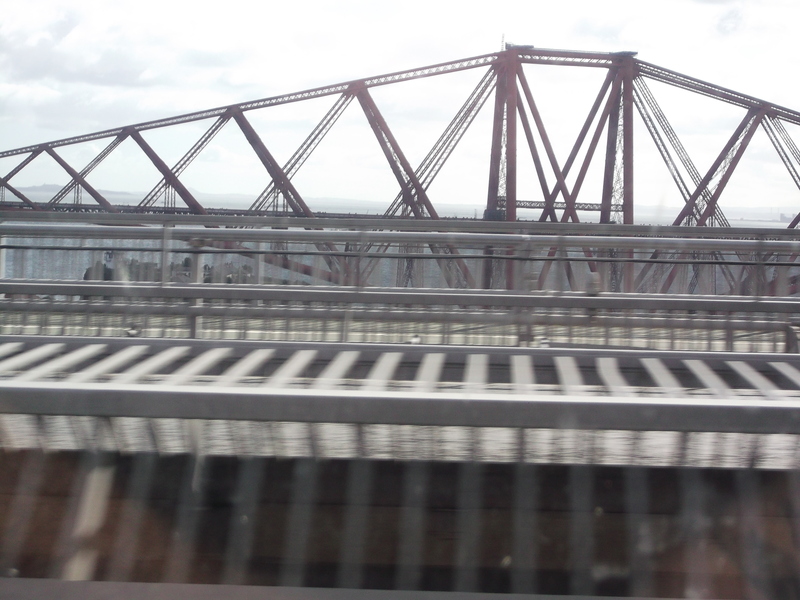 We went over a bridge whilst lookin’ at The Forth Bridge, that takes you into the Kingdom of Fife. The Forth Bridge is a cantilever railway bridge that spans the Firth of Forth. Building started in 1883 and took 7 years to complete, havin’ a length of 8,296 ft, and the worlds second longest single span of 1,710ft. It was designed by Sir Thomas Bouch, but after the collapse of the Tay Bridge ( another of his projects), it was taken over by Sir John Fowler and Sir Benjamin Baker. It’s an engineering marvel ! Not a brilliant photo but then again I was doin’ about 90 an’ McArthur was hangin’ out the window…. again ! He never learns! After a drive through the Grampian Mountains with stunnin’ scenery, we decided to bypass Inverness this time as I was in a hurry to see Nessie. I’d heard she was only gonna be around for a few days and so drove down to a village called Drumnadrochit, which is right on the Loch Ness. 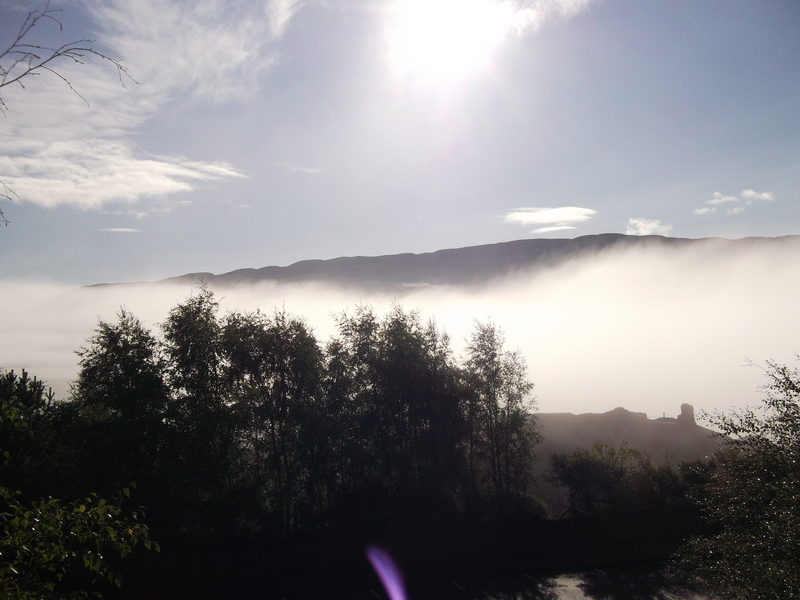 This was such a magical, mystical view that me an’ McArthur just had to sit a while an’ contemplate our next move. So, hope you join us next week when we continue the search for Nessie. 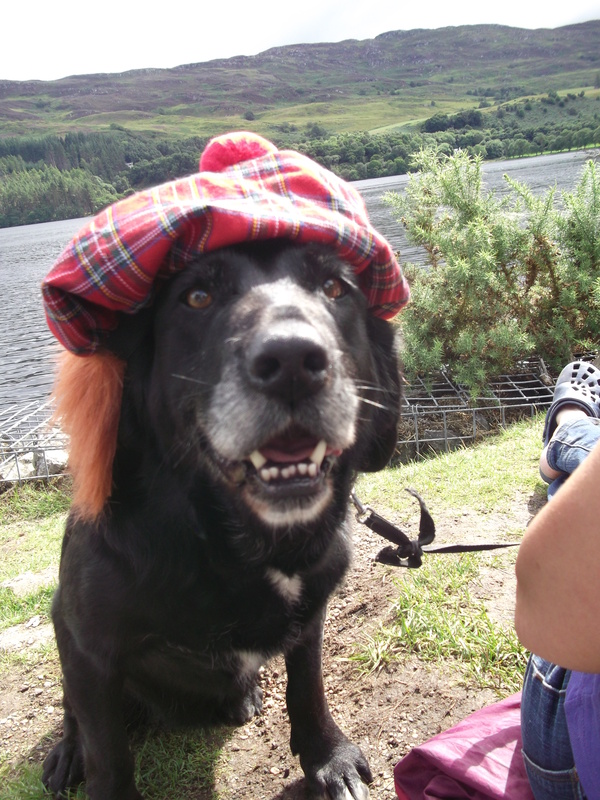 OH FLOWER OF SCOTLAND WHEN WILL WE SEE YOUR LIKES AGAIN………. 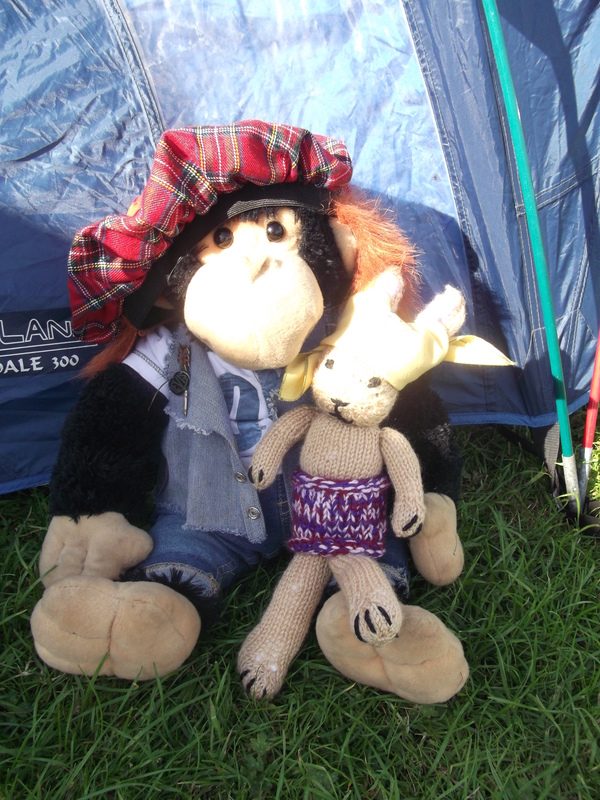 Hey jammers, at last I’ve made it to Scotland in search of my heritage, as I know I have ancestors from The Kingdom Of Fife. The first place to visit was obviously Edinburgh as the festival was happenin’ ! Managed to find a campsite pretty close by and the tent was put up and the beer cracked open ! After refreshments it was a little wander into the city, going through a park where we heard bagpipes. 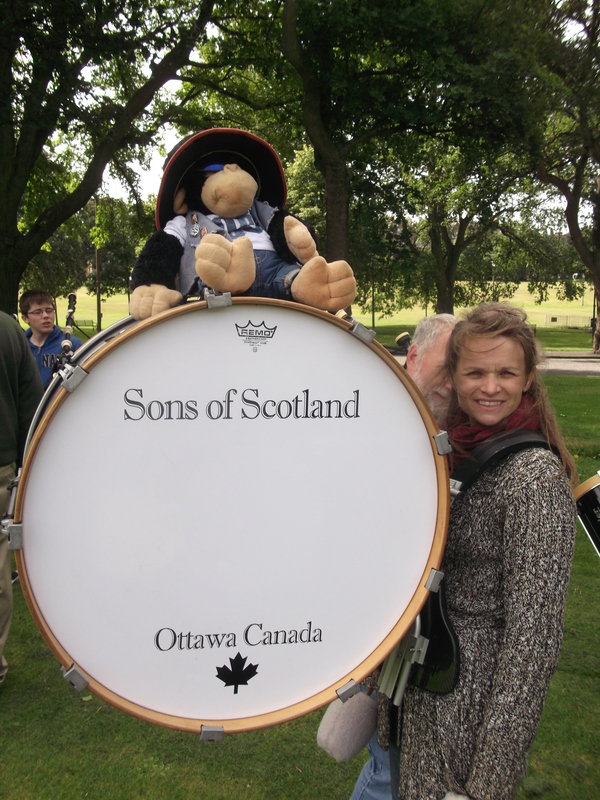 Well, would you believe it but it was me old mates from Ottawa, ‘The Sons Of Scotland’. “Hey, Bigmunkeyman !” They shouted. Course I had to have a little session with them. 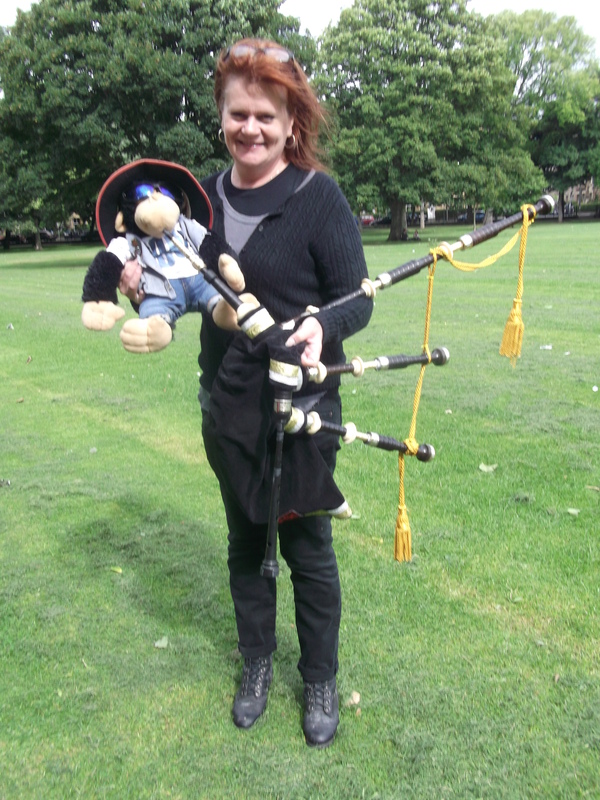 Hadn’t lost my touch on the bagpipes …… or with the ladies !! She was a good lookin’ woman and hey, I am bigmunkeyman! Had a go on the big base drum and hadn’t lost me touch on that either !! Of course another attractive lady helped ! After draggin’ myself away from all this attention, I finally made it into the city itself. Heck, it was BUSY ! I’ve not been in such a large crowd since Woodstock. The vibes were amazing with street performers, markets, free spirits and folk from all around the world. Now, a strange thing happened. Way back I had a friend called Arthur and the last time I saw him was when we were touring Scotland and he fell from the car I was driving, shouting ” Och aye the nu !” I thought he said ” Ach, I’m all right now “, so I carried on drivin’ shoutin’ ” Bye, bye baby !”, and I’ve never seen him since. I often wondered what became of him and back in the 70’s I mentioned this story to a group of Scottish singers who turned out to be the legendary ‘Bay City Rollers !’ The rest is history. 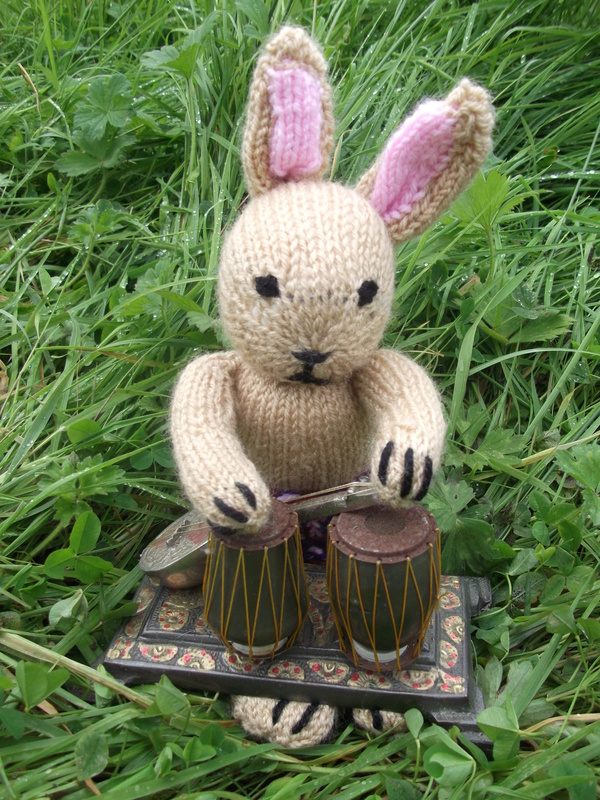 So, who the hell do ya think I bumped into but Arthur busking on his bongos ! So, me and me old mate mc Arthur spent the rest of the day getting re acquainted. ” What’s with the skirt Arthur ?” I asked. ” This is not a skirt!” he answered. ” This is the sacred robe of ‘The Psychedelic Punks’! That put me in my place !! Anyway, catch yer later jammers when next week I go in search of a certain monster ! Hope you join me !